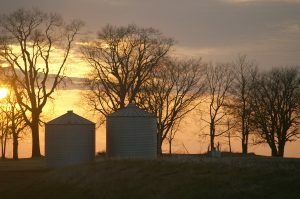 The twin cities of Bloomington (population 75,000) and Normal (52,000) are in the Illinois corn belt, about 130 miles south-west of Chicago. Bloomington grew out of ‘Blooming Grove’ in the 1830s. Normal, conjoined on the north, dates from 1865, and derives its unusual name from what is now the Illinois State University, founded as a teacher training college modelled on the French Ecole Normale. Abraham Lincoln had strong associations with the city, commemorated in the McLean County Museum of History. The founding fathers were teetotal nonconformists, and Normal was ‘dry’ until quite recently, a situation that managed to persist owing to the proximity of Bloomington. The local economy depends largely on agriculture and insurance. The city boasts two major hospitals and two universities (the second being the Wesleyan University in Bloomington). Bloomington-Normal stands on the famous Route 66. The hinterland is not all flat corn and soybean fields: there is interesting rolling countryside around the nearby Mackinaw River. 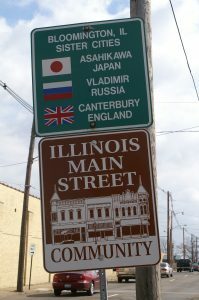 More information about the Vladimir/Canterbury Sister City Association of Bloomington-Normal can be found here.